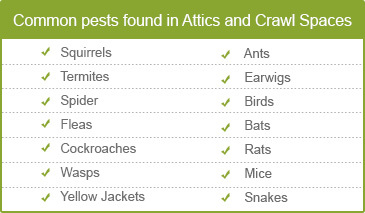 Attics and crawl spaces often remain the most ignored parts of the property. And by the time we notice any change for the worse, the damage is already done. Regular maintenance of the attic and crawl space not only keeps the interior of the building hygienic and immaculate, but also cuts down on unwanted expenditure. Furthermore, as most problems remain unnoticed in initial stages, calling a professional to inspect the property is a wise decision. We, at Quartz Solutions, are leaders in the field. Our comprehensive services provide you with unmatched results in the most hassle free manner. Un-kept and unattended attic and crawl spaces are home to numerous troubles. Pests and rodents have the potential to contaminate interiors, spread diseases and damage structural elements of the property. Moths and mice can ruin your favorite garments or feather blankets, carpets and upholstery. Also, the mess they leave behind can evolve into a health hazard. Dripping ducts can impair the insulation system of the building, and inflate power bills. Birds and bats move about damaging wiring and insulation ducts. Here at Quartz Solutions, we believe that protective measures can go a long way in keeping the sensitive areas of your property safe from infestations. Timely action also cuts down on the financial toll of repairs. Equipped with state-of-the-art technology and experienced work force, our crew inspects your property for free, at a time that is most suitable to you. Testing for leaking gases, presence of animals and pests, impaired air ducts and damaged wood; our team will inspect every corner of the property. Once the problems are identified, we’ll recommend the most cost-effective plan to resolve the issues quickly. We understand the value of your time and money. 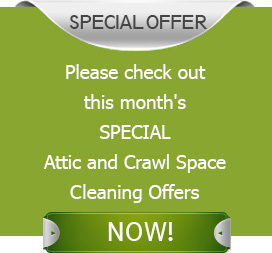 Our attic and crawlspace services are reasonably and competitively priced, with no hidden cost. We adore Hasbrouck Heights and admire the warmth and love of the residents of this small borough! We too wish to contribute to the well being of this community. Look no further than Quartz Solutions to keep attics and crawl spaces professionally revamped and done – for years to come. Call Quartz Solutions 201-205-2042 for a free on-site inspection!